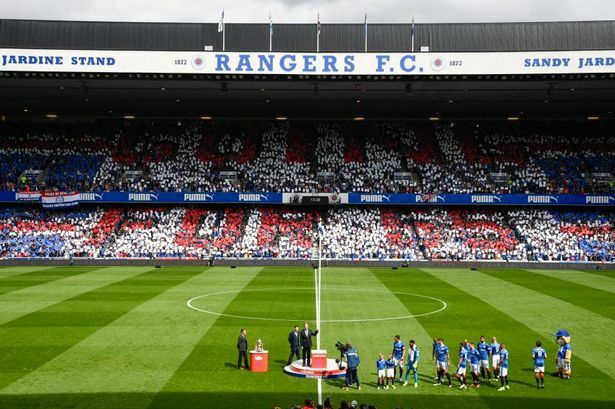 Ibrox Noise: A congratulations to Celtic, from Rangers? A congratulations to Celtic, from Rangers? Let’s take nothing away from the achievement of Celtic creating history in Saturday’s resounding 2-0 victory in the Scottish Cup Final. It was an easy, expected result over bottom 6-club Motherwell at Hampden Park. Celtic are now the only team ever to win the treble, two years on the trot, so how was it done? One way was to totally eliminate any competition who had the audacity and talent to beat them over the course of a season. What Celtic, with the help of Hibernian and Dundee United, did to Rangers and Scottish football in 2012, was one of the greatest travesties ever. Another method is to control the SPL and the way the SFA look at everything now, since Celtic took over from Rangers as the runaway winners of the most non-competitive-league-ever known! 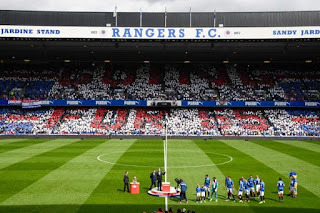 God bless the bhoys for their heroics against teams with little or no money, as the blue pound has been sorely missed throughout the land, since the ‘Gers were inexplicably bounced down to play in the lowest league in Scotland - division 3. If you think I have spat my dummy out of the pram – well you are right! Shame on you Celtic for capitulating the whole of our game up here and ripping the standard of quality players plying their trade in Scotland to shreds. With no real money to spend Aberdeen, Rangers, Hibernian, Hearts and Kilmarnock have to make do with signing as many free transfers and loan deals as they can muster. The short-sightedness of the board of the east enders of Glasgow astounds me. Are they really so ill-advised that they could not foresee the problems that eliminating Rangers to the bowels of football was going to harm their own profit margins in the long term? There’s been talk of ‘asterisks’ against Rangers’ legitimate title wins of the past, and yet Scotland’s media never mentions how comically invalid Celtic’s achievements of the past seven years or suggests an ‘asterisk’ next to them. When you deprive competitive opposition it only reduces revenues at the gate, discourages sponsors and removes lucrative TV money. It has turned our game into a joke, especially down south, where they stopped watching our games in their thousands. With the similarly short-sighted Celtic fans delighted to witness their team overwhelm Rangers on occasions and then watch the same players fail to turn up against Hibernian and Aberdeen at the end of the season, it must make them wonder at times – then again – maybe not! Confidence is growing that Steven Gerrard and his new staff and players may finally properly trade blows with Parkhead and give them a right bloody nose. And the best players at Aberdeen, Hibs and Motherwell are inelligible to play against their parent club, Celtic. You couldn't make it up. Gerrard obviously blames Rogers for losing the EPL title when at Liverpool,, there is no love lost between those 2,, But a lot of work to be done in the summer market,,, shite out,, quality in,,!! !